I gave a talk at the Global Speakers Summit in Noordwijk in the Netherlands in April entitled, ‘Unique’. It was essentially about finding out who you are by looking at what you’ve always done. Below is 12 minute edited version. I discussed my realisation that what I do now with my work is exactly what I was doing when I was last given the choice, when I was aged 7 to 15. To find out what and how, you’ll have to watch the film. 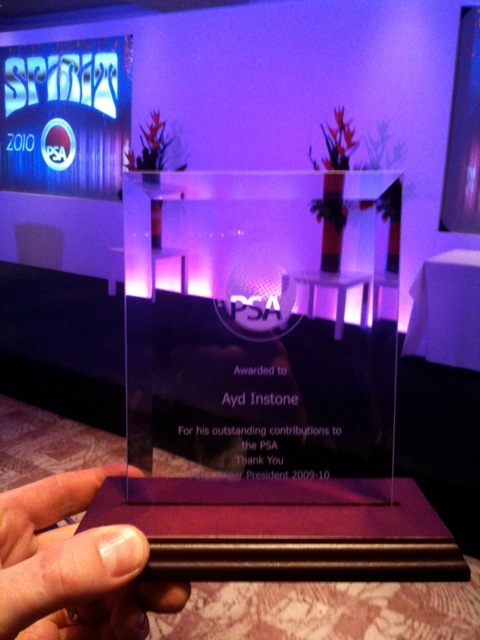 It says "For his outstanding contributions to the PSA"
There’s one thing I hate about the annual Professional Speakers Association Convention: lunchtime on Sunday. We’d all been locked in the hotel together, around 100 professional speakers, since Friday morning, having seen nine speakers present from the main stage, attended 6 workshops, had two dinners, lunches and breakfasts, three hour panel session, lots of networking coffee breaks, a multitude of catch up chats, numerous laughs and far too many late night/early hours of the morning ridiculously silly joint ventures planned. So for it all to come to what seems like an abrupt end come Sunday lunchtime is a jolt to the system. The cure for that deflated feeling is what I’ve been doing now. Getting out my notes and once again getting excited about what I’ve seen, heard and learnt and most importantly what I’m going to do differently to benefit my own business. The main part of my review of being at such an event is to look at who I’m now going to contact and connect with, to thank them, to further some conversations and to discuss ideas with. 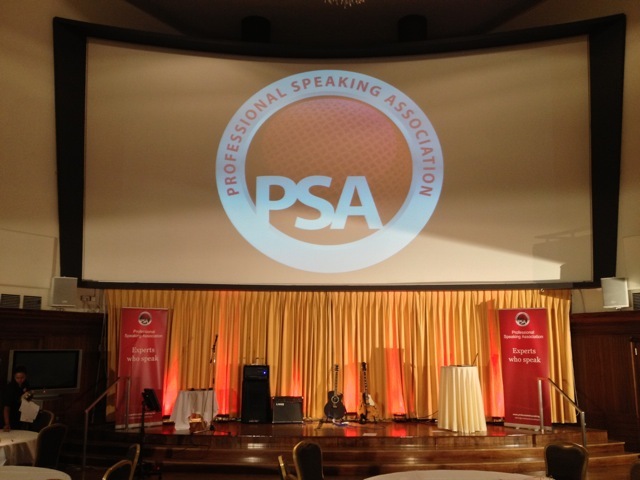 Is it a bit flippant to say it was the best PSA Convention I’ve been to? (I’ve been to the last 6). Objectively I think perhaps it was as the best. 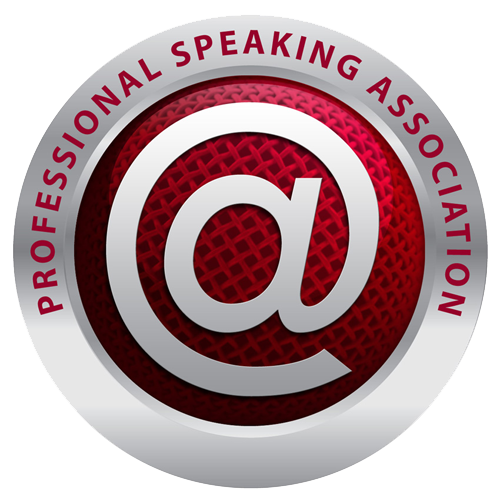 All the speakers were powerfully enlightening, entertaining and at the top of their game. Subjectively it certainly was, and I’m not just saying that because they gave me an award. It was the first time I was actually embarrassed going on stage since I was awarded my 2 metres swimming certificate and sew-on patch for my trunks… aged 14 (my primary school had lost it, then later found it and forwarded it on to my subsequent school.) So on Saturday night after the awards were given out for speaker excellence to the great and the good I would have kindly refused had it not been such a nice piece of etched glass with the words ‘The presidents award for outstanding contribution’ on it. My thanks to Peter Roper and the board. Better than a badge with a fish on it. But I won’t sew it onto my trucks, might cause me to sink. And anyway, it’s not about me, it’s ‘all about you’ as new PSA president @grahamjones has put it. Every year the PSA has a ‘theme’ to focus the mind for the year ahead and to have something different to put on the marketing materials. The new theme for the year is @. Can you see what he’s done there? It means it’s all about connections, because it is. Whether that’s online connections using technology or just by keeping in touch over the phone or having meetings. It’s about external and internal connections, just like how our brains work by neurons connecting together to fire new combinations of ideas. Having a new theme doesn’t mean the old ones don’t still apply, and their have been some good ones, which apply to whatever business you’re in, whether you’re a ‘speaker’ or not. We should all be there to ‘enlighten and entertain’, we should still have ‘astronomical aspirations’ and we should all be embracing the ‘Spirit’ of creating a sharing community. This new theme is no different. It should apply to us all. We all need to enhance the connections we make. But I’d like to squeeze a few bonus meanings out of Graham’s ‘@’ theme. As well as being the symbol for email and twitter, meaning ‘at’, it’s also shorthand for ‘and’. I’m taking that as an extra cue for the year: AND: what else can I do to be better? AND: what else can I do to connect with more people, AND: what else can I do to help? AND there’s a third significance for the symbol ‘@’. It’s a mnemonic, which is a device used to simplify a complex process. For example computer ‘machine code’ is actually an endless stream of binary 0s and 1s, but few people can program a computer and get it to do anything useful using binary. It would just be too complicated and take too long. So binary processes are group together and simplified by being given a mnemonic, a name that we can understand and relate to that represents the complex process. This year, whenever you see the @ symbol, let’s all realise that WE are mnemonics with our businesses. 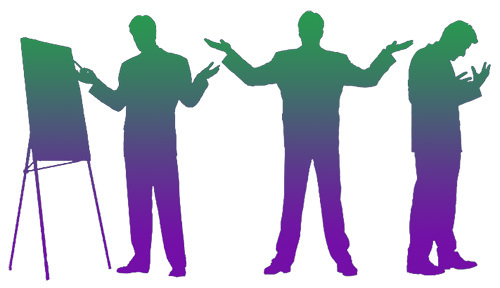 We are all here to make complex processes easier to understand so that our clients, customers, audiences or whoever we serve, can take action, make changes and improve their lives in some way. WE are the connectors. We ARE the @. AND that’s where it’s @.